Part of the beauty of Sheedy’s is its location mid-point on the Wild Atlantic Way – just 10 minutes from Doolin and the Cliffs of Moher. This means you’re perfectly placed to experience the rich culture, history, beauty and natural wonder of this much-loved part of Ireland. John and Martina have always lived in the area and are happy to share their knowledge of places of interest – from local Irish music nights to incredible hikes and walks. Experience Ireland at its most rugged, panoramic and naturally beautiful – just 10 minutes from Sheedy’s. 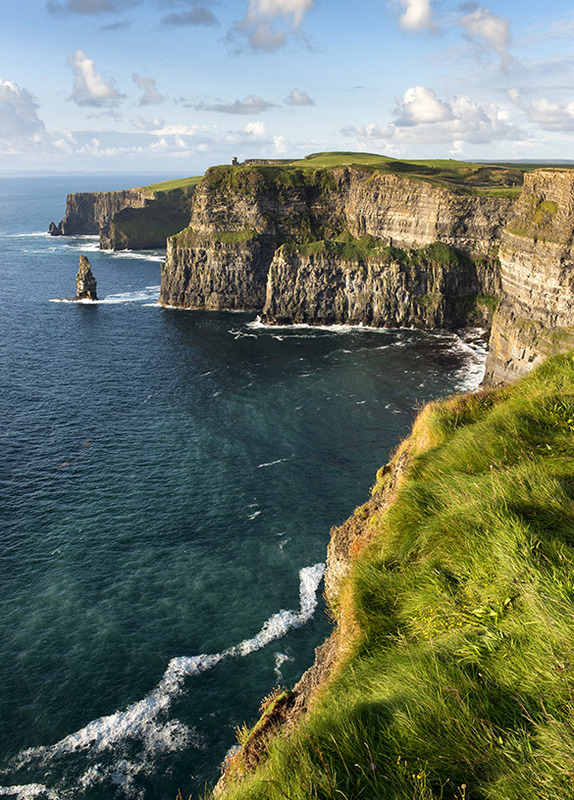 A Signature Discovery Point, The Cliffs of Moher offers over one million visitors each year a totally multi-faceted experience of Ireland’s incredible West Coast. Stretching for 8 km and reaching a height of 214 metres, the Cliffs are a fascinating historical wonder, a geographical focal point, a conversational hotspot and area of immense natural richness and importance – all in one incredible destination. Standing on the Cliffs, you’ll take in majestic views of the Aran Islands, Galway Bay and Connemara. The Cliffs are also home to20 different species of birds as well as a wealth of birds, flowers, marine life and sea and land mammals. A visit to the Cliffs of Moher Visitor Experience is a must – containing a wealth of fascinating information and displays on the Cliffs. View the Cliffs by following one of many cliff top trails – or take a short drive to Doolin and catch a one-hour boat trip to view the Cliffs from the sea. You can also sail to the Aran Islands from Doolin, after enjoying the festive tradition and fun of this pretty coastal village. 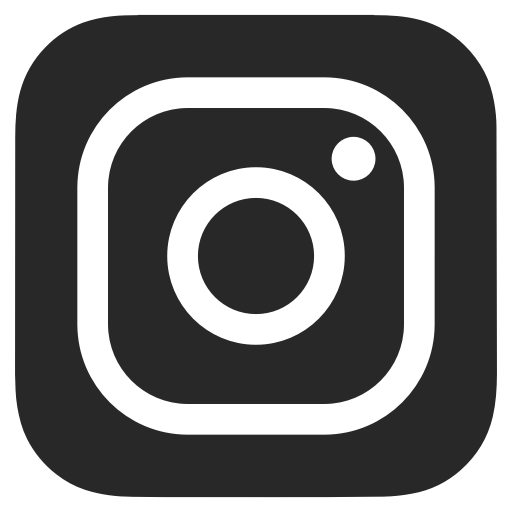 For your convenience, Martina is happy to arrange any outings or excursions for you. The Burren is a dramatic karst landscape, underlain by limestone which covered most of Ireland approximately 350 million years ago. The Burren Way from Doolin to Ballyvaughen is a very popular and pleasant walking route – and here you can blend wonderful discovery with the embracing open air and the magic of this haunting place. You’ll learn about a vast array of wild flowers indigenous to this glacial landscape – as well as an abundance of wildlife. You can explore the history of the land and its people and the legacies of past generations – seeing beautiful old farm homesteads, the ancient famine road and a host of monuments all along the way. Maps are available from John and Martina who will happy share with you, advice and tips on best routes and favourite places. Taxis can also be organised. Don’t miss Vaughan’s Pub at nearby Kilfenora! It has traditional Irish set dancing every Thursday and Sunday night and is very well known as the pub used in the legendary Father Ted TV series. There’s no better way to get a taste for the real Irish rural experience than by getting comfortable in some of the local ‘locals’ – Irish culture at its most vibrant and welcoming. The great thing about staying at Sheedy’s is it takes just a stroll across the road to embrace Lisdoonvarna’s lively pub culture. You’ll find a pub seisun in nearly every pub – an informal gathering of musicians. From traditional fiddlers to tin whistle players, beautifully haunting Irish voices and lyrical local story tellers – this is Ireland at its best. Just add some great local craft beers, good conversation and the best of pub atmospheres. 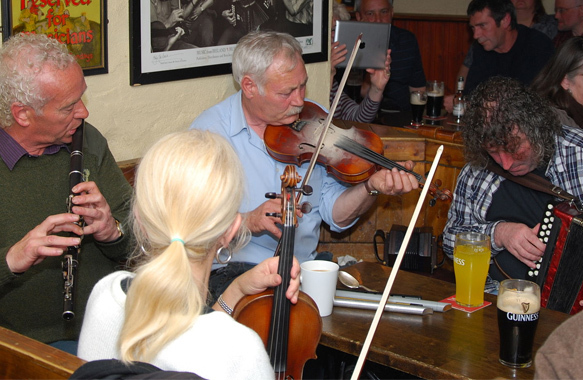 Doolin is known worldwide for its wealth of Irish traditional music and there is music nightly in all the pubs in the summer months. 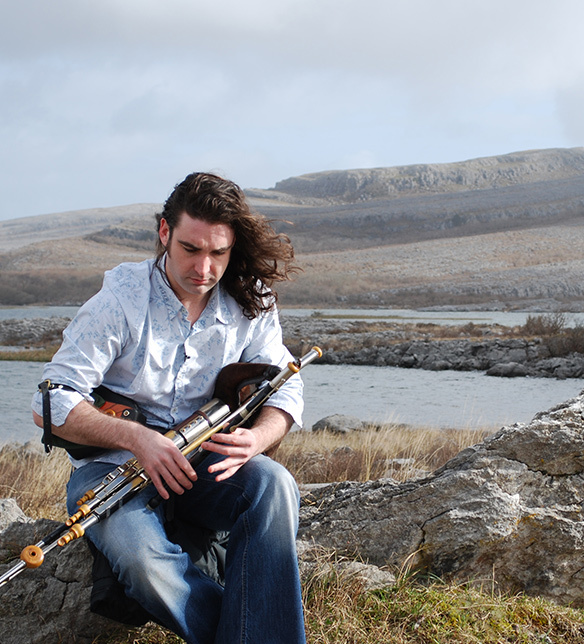 Many well-known names in Irish music have begun their careers in Doolin – and many established musicians regularly return to join in a session or two. Further afield, experience music sessions and a good craic at any of the little villages around us – whether you’re chilling out in Ballyvaughan or getting lively in Milltown Malbay. Enjoy fine golf on some of Ireland’s best courses – Lahinch is just 13km away and Doonbeg a 32 km drive from Sheedy’s. Find your beach paradise surfing at Lahinch or enjoy a wide range of beach activities at White Strand, Spanish Point or Fanore – all Blue Flag beaches. Explore the fascinating Aillwee Cave, with its underground waterfalls and stalactites, coupled with a visit to the Birds of Prey Centre next door. Find a little piece of heaven at The Burren Perfumery and Floral Centre – Ireland’s oldest perfumery. From a treat of a tea to perusing the vast array of floral creams, perfumes and oils – it’s pure indulgence. Something truly different and really rewarding is a Burren Farm Heritage Tour. A local farmer will lead you on a tour and share his knowledge of Burren secrets– from local history to heritage and farming traditions. Come in May and you’ll catch The Burren in Bloom Festival – celebrating early summer with talks, walks and musical events. History-lovers will enjoy touring the area’s castles, towers and ancient ruins, including Kilfenora Cathedral, Corcomroe Abbey, Martello Tower and Kilmacduagh Round Tower which is one of the last intact round towers in Ireland. A literary treat is yours at Coole Park, once home to Lady Gregory and the gathering place of many famous names in Irish literature, including WB Yeats and George Bernard Shaw. Stroll through the beautiful parklands, see the famous Autograph Tree and stop by the lake to see the swans immortalised in Yeats’ ‘Wild Swans at Coole’. Take in the beautifully redesigned Vandeleur Walled Gardens in Kilrush, with its mazes, water features and greenhouses. Get the adrenalin going with North Clare Sea Kayaking. You can recharge while paddling alongside playful seals – or take an exciting paddle into hidden sea caves. Find out why the lakes of the River Fergus are described as ‘an angler’s paradise’. Burren Angling Guide will give you an experienced guide to fly fish for pike and trout from a boat – all tackle is provided. Tour The Burren on a quality Kalkhoff electric bike from E-whizz – guided and self-guided tours of The Burren. You can take in all the well-known landmarks and many more scenic and historic sites. 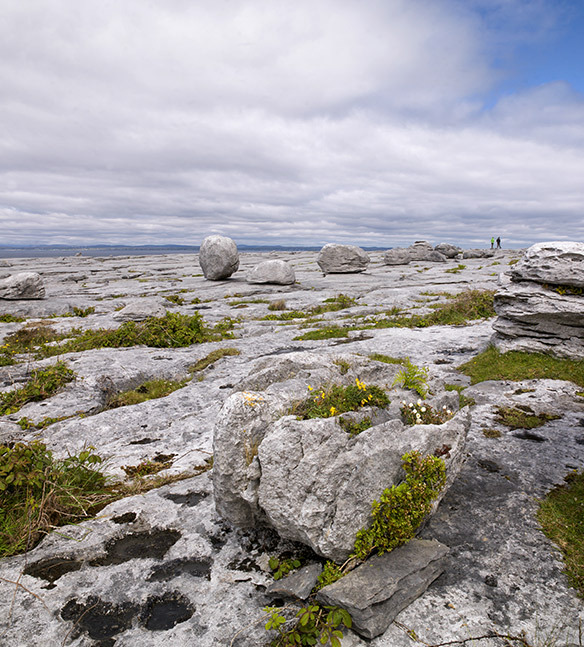 From rock-climbing to hill-walking, Adventure Burren lets you explore and experience The Burren in the best possible way. Get right to the heart of historic Ireland at the Poulnabrone Dolmen – ‘the hole of the quern stones’ portal tomb that dates back to the Neolithic period, between 4200 BC and 2900 BC.